[Resolved] Hit by bug again!! Re: Hit by bug again!! Yes, is it not working. ? It's running the scan, but no seeing the scripted we would like to use. I did get a message saying the text file may be misspelled. OK this seems to be the problem. Please download the attached CFScript.txt file and save it to your Desktop. Make sure your Anti-Virus is disabled while we do this. You can disable your Anti-Virus and Anti-Spyware applications, usually via a right click on the System Tray icon. They may otherwise interfere with our tools. If you have difficulty properly disabling your protective programs, please read this. When the scan finished, it will execute the script and reboot your computer automatically. Don't reboot your computer manually, let ComboFix do it. Once your computer is rebooted, ComboFix will start preparing a log. Please let it do so unhindered. After a few minutes, it shall produce a log for you. Please include the C:\ComboFix.txt in your next reply. Should I delete any SFScript.txt files I have previously saved? Yes please. It was meant to be CFScript.txt not SFScript.txt. Misspelling was only in my reply to you. I think the issue was not successfully dragging the file to Combo. I am now getting a message that I am over the limit when tried to paste the log to you so I attached. NOTE: If using Internet Explorer and get an alert that stops the program downloading, click on the warning and allow the download to complete. Close all programs and click on the AdwCleaner icon. Download zoek.exe from here: http://hijackthis.nl/smeenk/ and save it to your Desktop. Double click zoek.exe to start the program. Note: This script is written for usage on this users computer, do not use it on another computer even if the problems are similar ! Click the "Run script" button and wait patiently. When finished the logfile will be opened in notepad. If a reboot is needed the logfile will be opened after reboot. The zoek-results.log can also be found on your systemdrive (normally C:\). I am pasting both so I hope I don't get the too large message again. Tool run by Jeqn on Fri 07/25/2014 at 19:29:02.46. 7/25/2014 7:30:17 PM Zoek.exe System Restore Point Created Succesfully. Ports: COM Ports NOT Present. LPT Port NOT Present. "EPLTarget\P0000000000000000"="C:\Windows\system32\spool\DRIVERS\x64\3\E_IATILAE.EXE /EPT EPLTarget\P0000000000000000 /M XP-410 Series"
"Carbonite Backup"="C:\Program Files (x86)\Carbonite\Carbonite Backup\CarboniteUI.exe"
"EEventManager"="C:\Program Files (x86)\Epson Software\Event Manager\EEventManager.exe"
"command"="\"C:\\Program Files (x86)\\NTI\\Acer Backup Manager\\BackupManagerTray.exe\" -h -k"
"command"="\"C:\\Program Files (x86)\\EgisTec IPS\\EgisUpdate.exe\" -d"
"command"="\"C:\\Program Files (x86)\\Fitbit Connect\\Fitbit Connect.exe\" /autorun"
"command"="C:\\Program Files (x86)\\Hp\\HP Software Update\\HPWuSchd2.exe"
"item"="MapsGalaxy Home Page Guard 64 bit"
"command"="\"c:\\Program Files\\Microsoft Security Client\\msseces.exe\" -hide -runkey"
O4 - HKCU\..\Run: [EPLTarget\P0000000000000000] C:\Windows\system32\spool\DRIVERS\x64\3\E_IATILAE.EXE /EPT "EPLTarget\P0000000000000000" /M "XP-410 Series"
We need to re-run ADWCleaner. Also can you tell me if you are still having issues with pop-ups and speed issue? I am not sure how to tell if it is done. I let it run all day and came home and clicked "clean" Had issue at start up so had to run again as report wasn't save. So I hope this is it. The pop ups and slowness have been resolved. I have my laptop set up to a large screen monitor and use an alternate key board when its key board stopped working.. Can you tell why I have to hit F5 key on the laptop key board to get windows to load? Can you tell why I have to hit F5 key on the laptop key board to get windows to load? Can you explain what happens when you start your computer up? Do you get an error message before you have to press F5 to boot up Windows? The not loading has been an issue for awhile. It boots up but the screen stays dark , no error message. I don't remember how I realized hitting F5 would cause Windows to load. Not sure how to explain but if I try to use keyboard the letter J auto runs across the field until I use the laptop keyboard backspace key to erase. like the JJJJJJJJJJJJJJJJJJJJJJJJJJJJJJJJ. I am not sure if the 2 issues are related. The laptop is just out of warranty so I have been trying to extend it usefulness as much as possible. I have been living with the issue by just leaving it on and using my Cromebook for emails etc. It does sound to be a odd fault. F5 is normally a refresh key. I would suggest posting this fault at General Computer Issues once we have completed removing any malware that is left. Note:ESET recommends disabling your resident antivirus's active protection component BEFORE scanning , how to do so can be read here. Use Internet Explorer to navigate to the scanner website because you must approve install an ActiveX add-on to complete the scan. 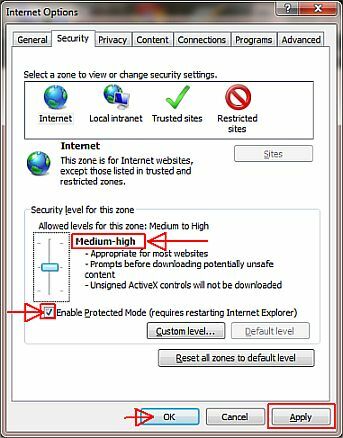 If you are using Vista or Windows 7 or 8, launch Internet Explorer by right-clicking the Start Menu icon & selecting "Run as Administrator". Make sure that the option Remove found threats is checked. Check in "Uninstall application on close"
Select "list of threats found"
Select "Export to Text File" & Save the Report to your Desktop as ESETScanLog"
Place a checkmark in "Uninstall application on close"
Close any open windows, save your work. Double click the TFC icon to run the program. ] (Note: If you are running on Vista, right-click on the file and choose Run As Administrator). The program should not take long to finish its job. Once it's finished, click OK to reboot. When I run TFC it opens my library folder. At no time does it have an OK tab. I have run it several times.... it has cleaned files but even after letting it sit for an hour nothing happens after library folder pops up. Re: [In Progress] Hit by bug again!! As long as the program completes the clean up and you get an Exit button the program has done it's job. I believe it will ask you to reboot if it needs to, that's when you have to click OK. Thank you for pointing this out to me.